A seven-year campaign led by Littoral’s Ian Hunter and Celia Larner has saved Kurt Schwitters’ Merzbarn , in Elterwater Village, Cumbria, United Kingdom for the nation. 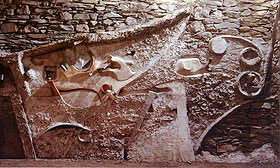 Famously, after his expulsion from the Dada artists, Schwitters rebranded his unique practice, Merz. Through the twists and turns of fate an history (including fleeing Germany during the Second World War), Schwitters found himself living and working in the Lake District. While eking out a living painting portraits and landscapes he approached a local farmer for some space to begin his third and final Merzbau (Merz Building), the others being in Hanover and Norway, both now destroyed. Though uncompleted, its historic significance was first championed by Richard Hamilton in the 1960s when his attempts to save it led to one wall of the barn being moved to Newcastle to form an integral part of the Hatton Gallery. Following Kurt Schwitters’ 100th anniversary, Ian Hunter and Celia Larner of Littoral tracked down the Merzbarn . A conversation with its neighbor led to the discovery that for years the barn has been regularly visited by artists and curators from all over the world. After a Schwitters conference in 1999, a committee was established to raise the money to buy the barn, although the owner’s £250,000 price tag seemed insurmountable. Prompted by his need to raise money to put his daughters through university, he agreed to accept £150,000, with a year for the money to be raised. First port-of-call was Richard Hamilton, who offered to do anything he could for the fundraising effort. While an application was made to a foundation, a fundraising event was held at Tate Britain and an unexpected phone call from Science Ltd (Damien Hirst’s company) resulted in the donation of a £140,000 spin painting. This, plus the foundation’s funding enabled the exchange of contracts last October. 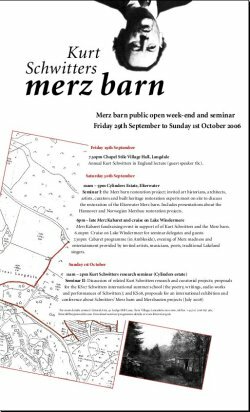 Quite aside from saving an incredible piece of modern art history, Ian and Celia describe the saving of the Merzbarn as being as much about the “recatalysation of Merz critical legacy”. The restoration of the barn is currently being planned, along with a full program of activities and opportunities for artists to become involved in the ongoing legacy of Schwitters and the barn. The first International Kurt Schwitters Autumn School which will include a conference, exhibitions and festival programme focused on new public performances and a critical review of the music, poetry, theatre work, literature, performances and dance projects, produced by (or influenced by) Schwitters during his life time. New works will also be commissioned from leading contemporary composers, musicians, poets, writers, and audio/web artists, etc, aimed at re-interpreting some of his key written or performed works, and/or as a tribute to Schwitters. There will also be research seminars exploring in more depth some of Schwitters’ collaborative projects and associated correspondence with; Rudolph Laban, Roland Penrose and Raoul Hausmann, and promoting new work on of some of his most influential written and ’performed’ works, such as the URSONATA www.costis.org/x/schwitters/ursonate.htm, and Anna Blume, www.magicdog.com/poems/pub/anna/. (Sept/Oct 2007). Guest Speaker; Professor Jerome Rothenberg (UC San Diego). Other speakers and participants to be invited include: Michael Nyman, Bryan Ferry, Brian Eno, Gavin Bryars, Christopher Fox, Masami Akita/MERZBOW, Tom Paulin, George Melly, Laban Centre, etc.